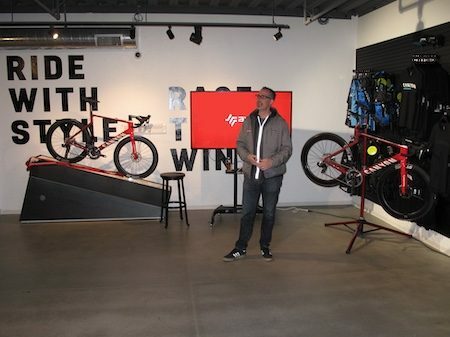 Last night (February 7, 2019) we were invited to Canyon Bicycles North American headquarters in Carlsbad, California for a day after roll out of SRAM’s new Red eTap AXS group set. You know, the one that retails for $4,600. After a welcome from Canyon NA CEO Blair Clark SRAM’s marketing mastermind Dave Zimberoff (pictured above) gave an overview of the idea behind the ground-breakingly expensive wireless, customizable, smartphone app-powered group set. Here’s a little of what he said. Nothing we heard from Mr. Zimberoff regarding the group sounded “simple.” Cables are “simple.” Wireless protocols? Smart apps that must be individually paired with each piece of the group? Not so much. Since we didn’t get to do much more than look at it while dodging the occasional drool gob from some of Southern California’s strongest cyclists, we decided to let the guys at GCN explain the complex setup, features, and the rest of the details surrounding a group set that we likely won’t be riding for at least a decade — cha-ching. Enjoy. Oh, one more thing: mountain bikers, the Reverb AXS dropper post costs $800. So you better start saving all those beer cans. . .